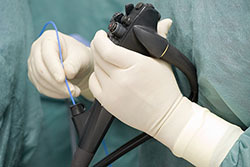 U.S. FDA, CDC, ASM together with the duodenoscope manufacturers and other experts developed a standardized surveillance protocol for duodenoscope sampling and culturing. This protocol is based on the recommendations from CDC’s interim surveillance protocol, guidelines from gastroenterology professional societies of the world and also from reports from U.S. hospitals. The protocol is intended to minimize the workload of the healthcare facilities that choose to implement duodenoscope sampling and culturing while maximizing the potential of detecting viable microbes. CDC and international guidelines recommend surveillance every 4 weeks or annually for all scopes that have an elevator mechanism or as per hospital infection prevention protocol. Aerobiology Laboratories has the capability to perform the plating method using filtration for the Duodenoscope surveillance. The lab can also provide the technical information for sampling and sampling kit for sampling of the scopes (does not include the brush). The turnaround time for analysis is 72 hrs, and if species identification is required will take an additional 2-3 days. The surveillance testing of Duodenoscope allows detection of “high concern bacteria” which includes Staphylococcus aureus, Enterococcus sp., Streptococcus sp. viridians group, Pseudomonas aeruginosa, Klebsiella sp., Salmonella sp., and other enteric gram-negative bacilli and “Low concern bacteria” which includes common skin and environmental flora.